"I gave this wonderful book to my granddaughter for Christmas and she loved it. This book is one we have to read together, because of words we both are learning. This book is bringing togetherness time for us, and quiet time for her doing coloring. We highly recommend this book for kids and families to read." "I love this book! I purchased the PDF version and I'm so glad I did! As a teacher, I think it is a great resource to use in the classroom because it has a little bit of everything: reading comprehension questions, language element, vocabulary, interactive coloring with awesome illustrations, and more. 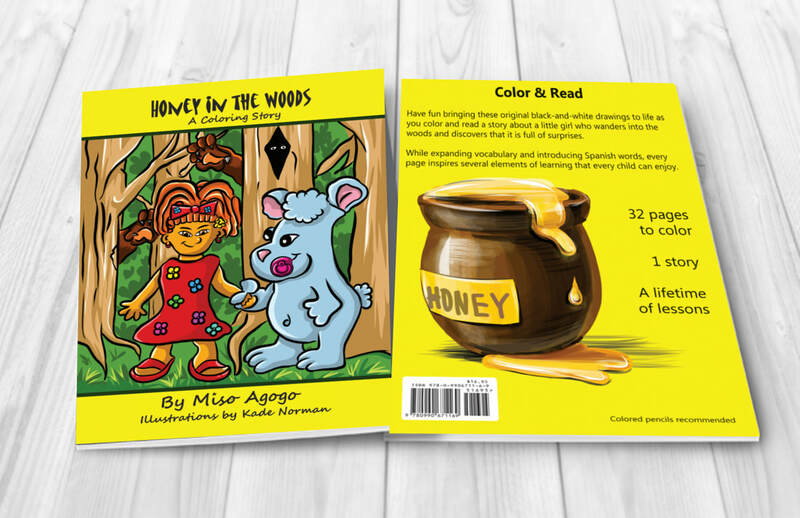 Honey In The Woods is a must for your home or classroom library!" "As I read this book, I was impressed by the vocabulary and the usage of Spanish words that are embedded throughout the story in a fun way that makes language learning fun for younger readers while at the same time helping them to develop a rich vocabulary. This book really celebrates just how neat it is to know new words and how they help you to expand your intelligence. I love the concept of bilingual books like this so that’s where much of my appreciation comes from. Black and white illustrations are absolutely fantastic and really help to support the text. Wonderful book to introduce Spanish to younger kids and a great way to incorporate more diversity in any classroom library. Gorgeous illustrations. Wonderful and fun story with a message of friendship at the end. Sure to enchant readers of all ages however I highly recommend for first to third graders." "It’s a current depiction of a child’s curiosity while driving literacy by introducing elements like foreign language." You can also leave a review on our Facebook page .